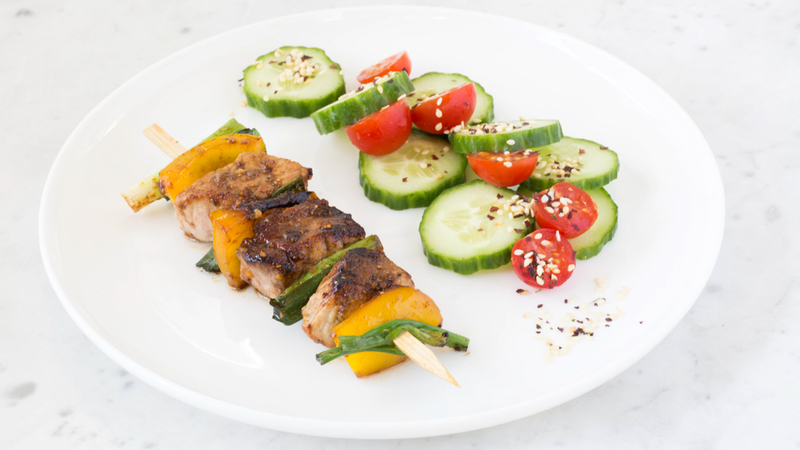 Pork gains loads of flavour from this quick dry glaze marinade. Combine dry glaze and oil in a resealable bag or bowl, add pork, and mix well to coat. Let marinate in fridge for at least 10 minutes and up to 24 hours, or freeze for up to 2 weeks. Alternately thread pork and vegetables snuggly onto bamboo skewers. Preheat grill to medium and lightly brush with oil to prevent sticking. Place skewers on grill and cook, 5–6 minutes each side until cooked through. 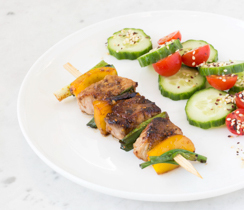 Place skewers onto a large platter. Sprinkle green onions overtop and serve.